Clarity Media can supply custom crosswords for your publication to buy on a variety of subjects and themes. So, if you want a crossword puzzle for a competition or promotion for instance on a particular topic just let us know your requirements, and we'll work with you to create just the tailored crossword you are after. Popular topics for custom theme crosswords include: Celebrity, Film, TV, Music, Football, Sport, Travel, Finance, Nature. Also crosswords specific to a time of year for instance Easter, Christmas or Valentines Day. You can find out more about Celebrity Crosswords here and Sports Crosswords here. We can usually create a crossword on most topics; even if they are relatively niche or specialist as long as there is a fair sized pool of words we can tap into. You can even send a list of some words that you would like to appear in the puzzle. 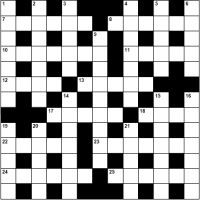 We supply our themed custom crossword puzzles in PDF or EPS format, so as the material is print-ready for publication. A range of grid sizes is available; if you print in colour we can provide the crossword is your desire colours; default is black and white. Please Contact Us with your requirements, and we'll swiftly get back to you with a response and quote, if appropriate. Please note that you should visit our Quick Crossword Puzzle page if you require standard quick crosswords.